Today the Castle theme gets a new figure – this time it’s a human warlock, casting a shadow bolt spell. She has apparently run out of Soul Shards and cannot summon her Voidwalker. Perhaps tomorrow’s set will provide a minion for her? 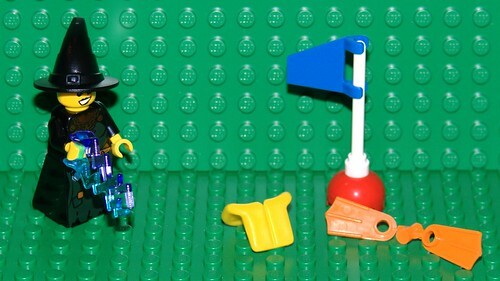 Meanwhile the diver from yesterday gets his fins along with a “diver down” flag buoy thingy and life vest. The fins are attached to the sprue from molding. Remember when 1×1 round plates came that way? Ah those were the days…. Anyway, I don’t see how he’s going to dive down very far to use his speargun with that life vest on! 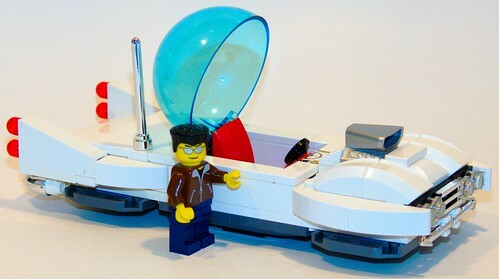 The other day I was thinking I’d build another hovercar, like my 2059 Cadillac or my remake of Justin’s red aircar. 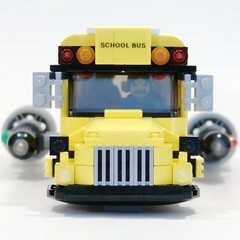 But as I was sifting through a bin of curved parts, the idea came to me to build a school bus when I saw some yellow Brick 2 x 4 x 1 & 1/3 with Curved Top (6081) parts. I built it 7-wide (not counting the rocket engines), thanks to an idea I got from Flickr users Lego Monster and Mad physicist since it leaves room for an aisle; see their bus for the inspiration. The bus is a hovercar, using the same kind of smooth underside that I used on the Cadillac and red aircar with the ‘Wedge 4 x 4 x 2/3 Curved’ (45677) and/or ‘Wedge 4 x 6 x 2/3 Curved’ (52031) parts on the underside to represent antigravity units. I also added some 1950’s sci-fi style rocket engines for those longer hops between lunar settlements. To see more, click the picture above or view the set on Flickr (or as a slideshow). At a recent BayLUG Space meeting, Justin brought a red aircar that he had built several years before. At the meeting, several of us were discussing how newer parts could be used to make it better. It started with the windscreen; several of us suggested replacing the one Justin used with the new curved windscreen seen in the Agents and Speed Racer sets. Then I started thinking about the various angled pieces Justin used, and how those could be replaced with curved pieces that are now available from LEGO, and asked Justin if he would mind if I made my own aircar based on his. Suicide doors built using 1x2x2 panels, with a corner plate to form a rear-view mirror. But I added a cheese slope to it for streamlining (and studlessness). Overall shape and color scheme, including ridges on the front “grill” which Justin made using 1×3 33 degree slopes, but on mine are 1×3 curved slopes. I also redesigned the underside and rear, which I felt could use more detail. 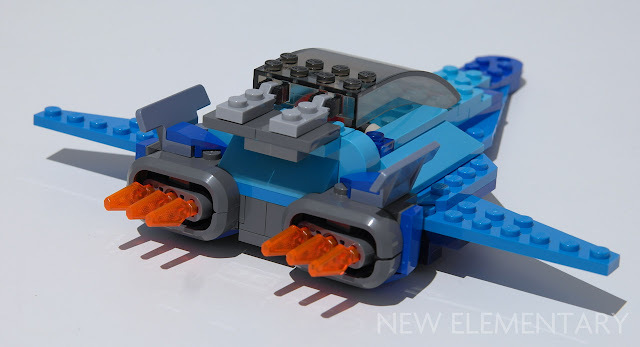 I built the underside studs-down and studless, similar to how I did the 2059 Cadillac aircar. Click the thumbnail for more pictures or view a slideshow. Inspired by the NASCAR fad that’s been going around the Flickr LEGO community, I built this using the layout photo from mikepsiaki. However I thought I’d do one with the Classic Space esthetic…. To get the Classic Space logo on the sides, I had to replace the 1×2 panels with 1×2 bricks. That meant the 1×1 brick with studs on two sides would no longer fit, so I substituted 1×1 Technic bricks with half-pins instead. Mike didn’t have anything between the rear wheels and the car body above. You could see clear through the car above the rear tires, and the car was very fragile. But the space was perfect for a 2×4 brick! Perhaps Mike uses that in his real model but just didn’t show it in the instructions layout image? 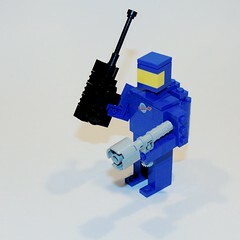 There’s a red Classic Space minifig inside! Of course, I really wanted a big Classic Space logo on the hood. I have a few of the 3×6 slopes that would have fit but it would’ve ruined the lines of the car, so I elected to stick with the original parts and just put Classic Space printed bricks wherever I could fit them. I used a dark blue windscreen; I don’t think they were ever made in yellow, so this is more like the 6890 Atomic Cruiser set than the 497 Galaxy Explorer esthetic that people tend to associate with Classic Space. But that Atomic Cruiser was probably as big of an influence on me as a kid as the Galaxy Explorer anyway. My version of a spaceman from the Classic Space of the early 80’s. Built to "miniland scale" like the models in Miniland in the Legoland theme parks. Still, I’m hoping that even in blue, it’ll still tug the heartstrings enough to help win the contest! Click the picture for the Flickr gallery, or view a slideshow. 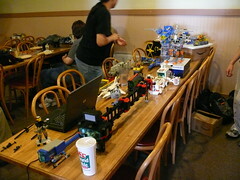 We had a meeting for the space-heads of the Bay Area LEGO Users’ Group at the local Round Table Pizza in Mountain View, CA on Sunday, 8/18. Click the image for more pictures or view the slideshow. Justin, a 19-year-old member who’s about to go back to MIT this fall, brought the biggest collection of ships to display. Charles and Adrienne brought a good assortment as well. Bruce, who almost never misses a BayLUG event but isn’t as actively into space, brought some trains and a LEGO wind turbine model which he’s been working on, and a clone brand Transformers-like set he had recently bought. We also had two kids, Aleks and Nikolas, and their mom Karen, who brought some Star Wars stuff and contest entries. I brought my Caddy as well as a new Classic Space truck. Bruce’s wind turbine is an interesting item; it was produced by LEGO as a limited edition set made available only for employees of the Danish wind turbine company Vestas. Bruce got a copy of the instructions online and built his own out of parts in his collection. Many LEGO fans have been clamoring for LEGO to offer it to consumers at large, but so far no luck. Justin and I had a little aircar rally; he brought an older aircar he had built years ago, and parked it next to my Cadillac. We had a group discussion about what changes we might make, given some of the cool new curved pieces available from LEGO. I’m especially happy with the studlessness of it… the only studs showing are the headlamps (which don’t count, in my opinion) and a few studs half-visible on the rear part of the hood. The underside is also smooth, using SNOT (Studs Not On Top) construction to mount parts upside-down. See the rest of the pics in my photoset: 2059 Cadillac El Dorado, or view a slideshow.